Written by Janet Choi on September 28, 2017 . 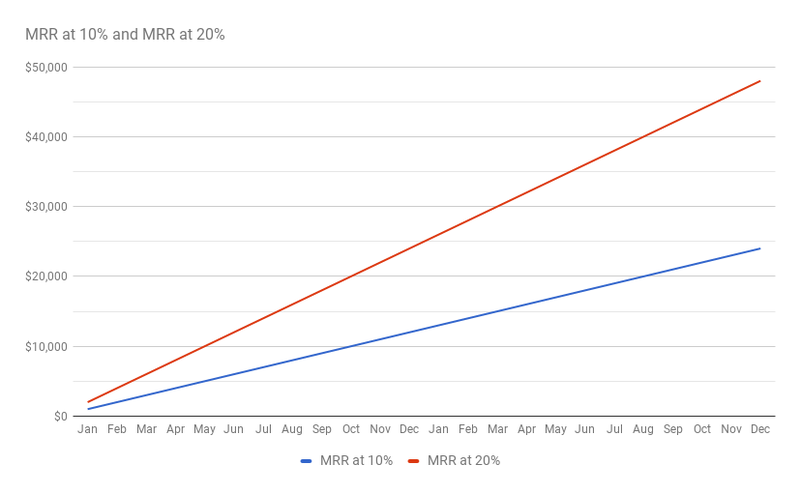 Sample result of high effort-to-value ratio Finding these kinds of relatively low-effort and high-value improvements is how you grow faster and build a strong business. And almost nowhere is the effort-to-value ratio more favorable than in activating (and reactivating) users from their abandoned free trials. It’s easy to assume that the user tried the product and decided it wasn’t right for them, end of story. But that’s rarely the case. There are usually more pressing marketing tasks to be done (yet another blog post, this week’s newsletter, etc.). You’re not taking advantage of inactivity data as a signal to get in touch. It may not be clear who’s responsible for communicating with users at this stage of the journey (post-registration and pre-conversion) or what to say to them. It’s more straightforward to work on attracting new prospects than nurturing existing signups. As a general rule, setting up triggered messages is almost always the best use of marketing time and dollars. Thoughtful automated messages scale to make the seemingly impossible challenge of doubling your conversion rates a possibility. 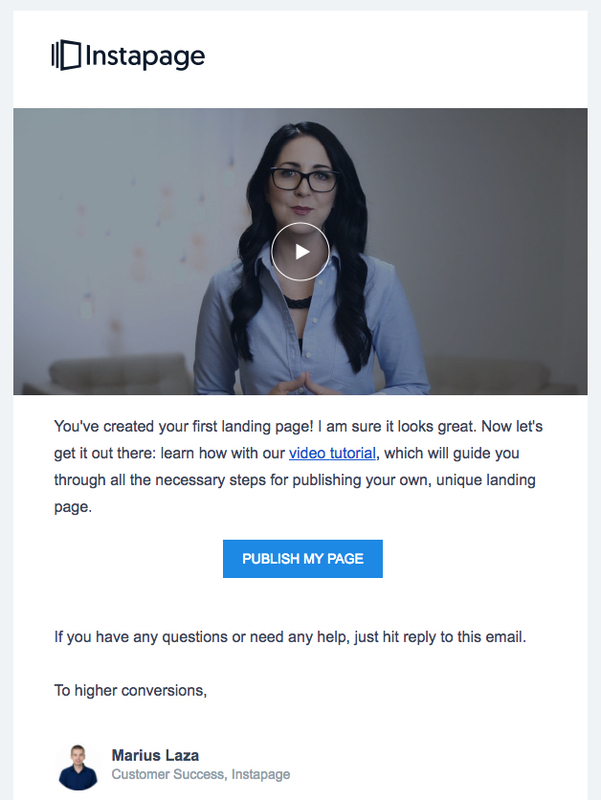 Typically, when companies who do send some type of emails at this point, they rarely get to the core of why the person signed up in the first place and the many reasons they didn’t convert. Instead, they often tend to be overly simplistic, and thus ineffective — from the friendly but generic “Hey, did you forget about us?” to the insensitive “Your trial is running out. Upgrade to continue.” to the Hail Mary discount offer. 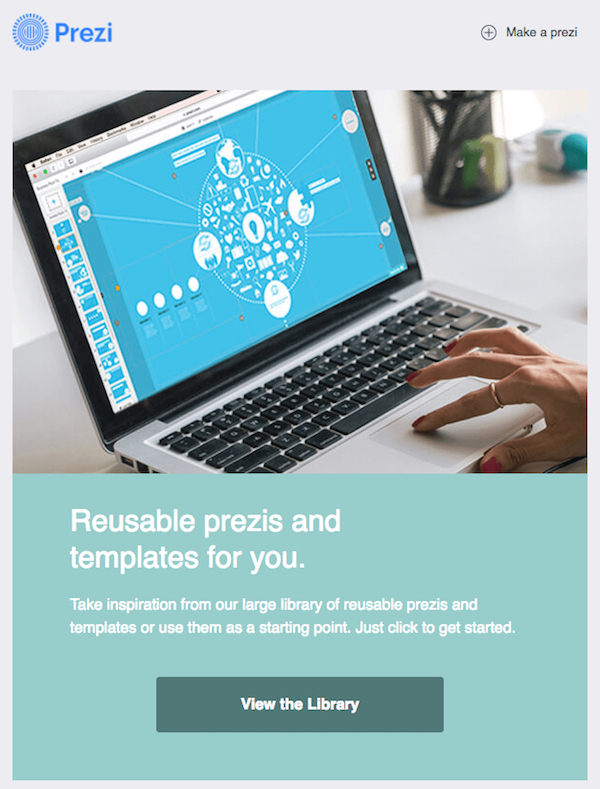 Instead, you can apply the elements of a perfect activation email. You don’t need to use all of them but they work well in combination. 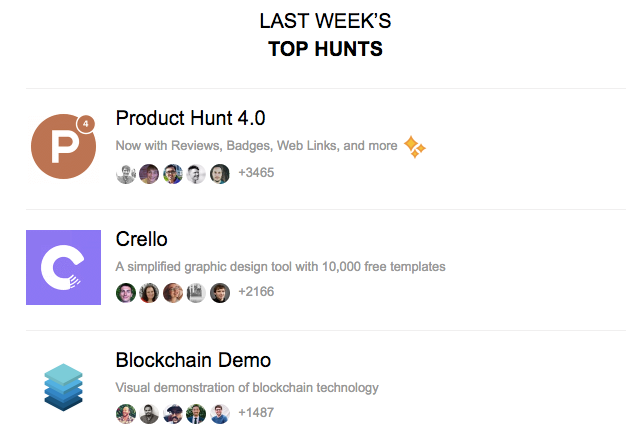 In this post, we’re talking about “activation” across a user’s trial period (when you notice they are inactive) and beyond the end of the trial, when you’d like to win them back (which you may also think of as reactivation). This is the prime window of opportunity to capitalize on whatever interest drove people to discover and register for your product in the first place. The later it gets past the signup date, the more you’ll think about different winback tactics because that interest and initial energy will have dissipated. So your goal is to reach out to folks who signed up for a trial and never got to give your product a fair shot and rekindle them with a spark powerful enough to get them meaningfully re-engaged. Expect to invest time creating a full campaign, not a few disparate emails. It’s also not a great time for your call-to-action to be about payment and upgrading, since you’re trying to motivate people back into intermediate stages of the buying journey, like consideration and evaluation. Instead, ask them to take one small step forward. Prompting an action, almost any action, means that you can start building momentum to work with. The elements mentioned below can be mixed and matched in a variety of ways. Let’s get to it! Meaningful personalization isn’t about customizing emails with the recipient’s name; it’s about sending messages at the right moment. It’s knowing when you’re at risk of losing the user and sending a helpful message just when they need it most. Instapage nails it in this email. They’ve identified that the user has created a new landing page but stopped there before publishing it. This is a key moment in the trial, super close to unlocking product value, and one that deserves a message. Remember, the effort-to-value ratio—there is a lot of value from getting people over the hump. 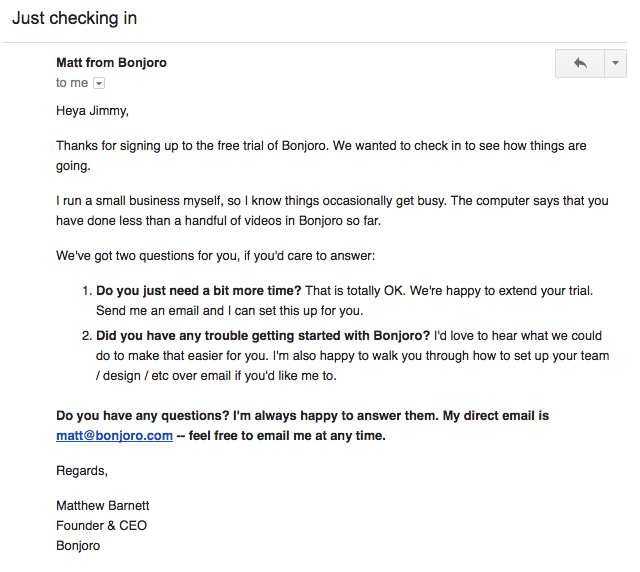 We’ll take this kind of personalization over an out-of-context drip email saying “Hey [First_Name], did you know you could do X?” any day. The truth is that you don’t really know why individual users don’t convert into paying customers. You can glean from data that people have trouble getting set up, or you might suspect that your competitor’s pricing is more attractive. But you don’t know until you start asking — and you’ll learn a lot by sending an email that asks for feedback. 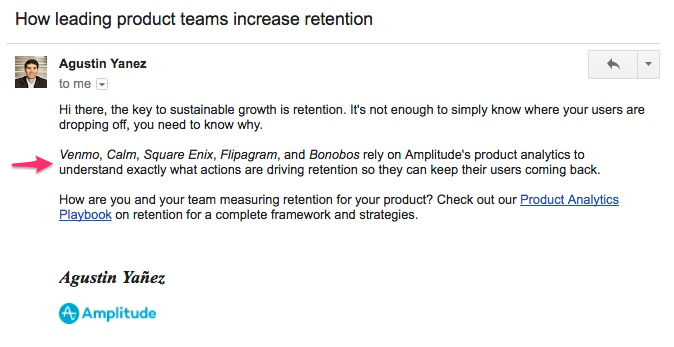 You might file this under “things that don’t scale,” but the message itself is easy to automate, and the feedback is so valuable that it’s worth the time it takes to read and respond. There’s nothing like data to state your case. 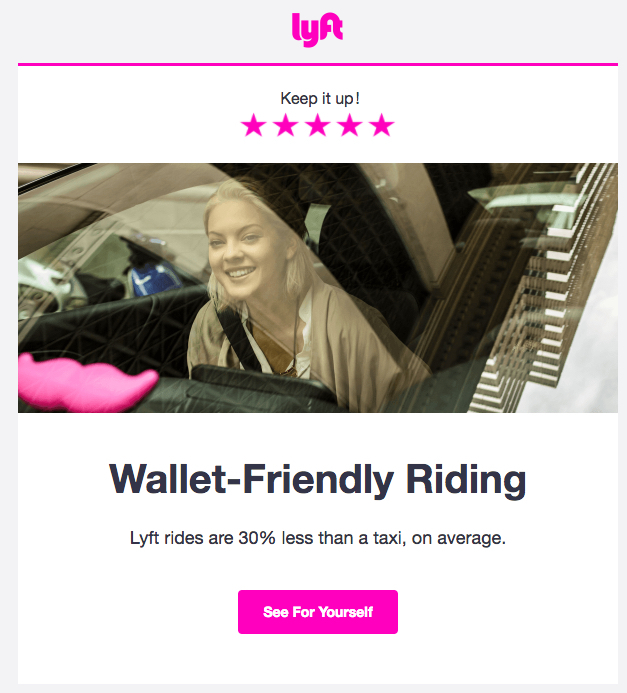 This email from Lyft is a great example of that. It’s simple and effective. If you have data—“Customers who do [X] net a better ROI”—use it! And use it liberally. At this point in the customer journey, where you’re looking to first reanimate activity, we recommend using the very popular urgency angle only in combination with other tactics. The reason is simple: think about how motivating it is to get a “time’s running out” message for a goal you don’t care about anyway. 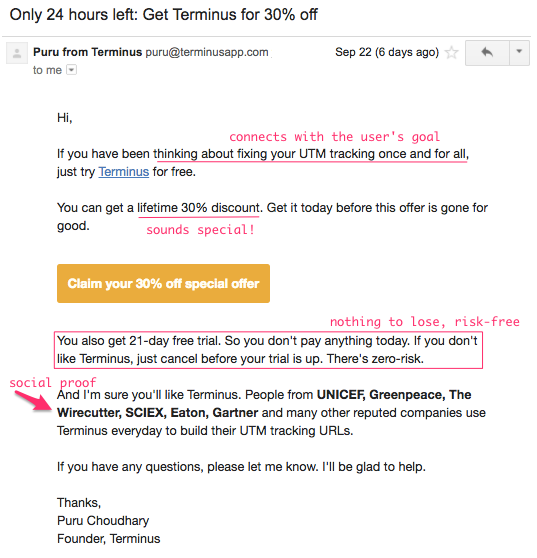 Here’s a nice reactivation email from Terminus that combines urgency (only 24 hours left, in a series that spanned approximately 4 days) with other persuasive activation elements: There’s social proof with the mention of what big-name companies use the tool, an exclusive-sounding offer of a “lifetime 30% discount”, a risk-free trial so you’re not jumping back into the paid subscription right away — and most importantly, it starts out connecting back with what would have driven you to sign up in the first place. You want help with your UTM-tracking process. Urgency works as an add-on here, not the main persuasive nudge. Do you think reactivating recently unengaged or inactive users is overlooked by companies? What’s your experience? Share with us in the comments!